With the crystal clear waters of the Maltese Islands and the abundance of easily accessible dive sites on Gozo, learning DPV Diving with us is a breeze. This course is, possibly, one of the most fun things you can do underwater. The instructor giving the course, who first used a DPV when they were the size of a small submarine, will show you how to safely use and enjoy today's small and powerful scooters. 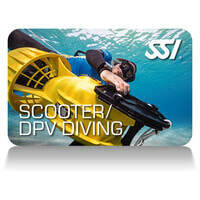 We use Bonex DPVs for the course ensuring you get a proper DPV diving experience.